Interested in reaching an audience that loves Hawaii? As a paradise destination, visitors to Hawaii want to make their vacation to the Hawaiian Islands a perfect one. Whether they’re coming for a honeymoon or family getaway, my job is to make sure it’s a memorable one! 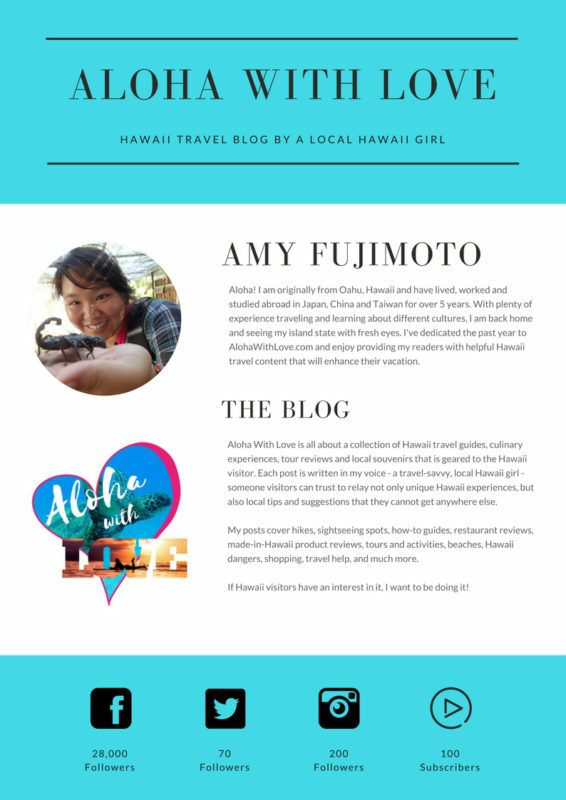 Click the picture below to download my media kit for more information and stats on Aloha With Love. Hawaii has a huge demand as a destination for romance so hotels, activities and venues for couples are always welcome. Pre-planning and wedding services in Hawaii are also encouraged. Safety has and will always be an important issue for me. The last thing I want is for my readers to begin an illegal hike or an adventure that is more than they can handle. Activities such as biking, ziplining, snorkeling, surfing, etc. would fall under this category to give readers an idea of what they can suspect on their own adventure. Hawaii visitors are always on the hunt for local cheap eats or fine dining with an ocean view. This is also a wonderful opportunity to explore Hawaii’s diverse menu and allow readers to learn about the different cultures that live together in Hawaii. Many Hawaii visitors come to Hawaii just to relax. Luxury, pampering and spas allow them to heal and recuperate from the daily grind of their lives at home.